Istanbul has more than 2,000 years of history and boasts a variety of cultures, religions and traditions. It’s a city with both Asian and European heritage, surrounded by breathtaking landscapes. Get lost in Istanbul’s incredible architecture, where ancient times are in perfect harmony with modernity. There is so much to see in Istanbul and so much to discover: explore the old quarter of Sultanahmet with amazing mosques and minarets and the charming Taksim Square in the Beyoglu quarter with its many art galleries and so much more! 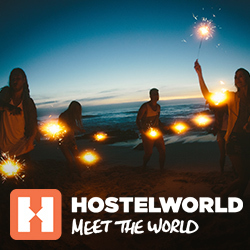 Once again, Hostelworld is here to help you plan your trip and show you the best hostels in Istanbul. The right way to discover Istanbul is to let yourself go, open up your mind for the unexpected, and enjoy the amazing and buzzing atmosphere. You know us, we love hostels because they give us the perfect way to explore a new city, so get ready to experience one of the most amazing cities ever! You’ll be starstruck by the beautiful sunsets over Bosphorus, the strait that runs between Asia and Europe, so brace yourself for one of the best moments of your life! Istanbul has so many amazing hostels, and we want to give you only la crème de la crème – the best hostels in Istanbul. Expect to find comfy, safe and warm places to rest your head after a day spent exploring. Here you’ll find hostels that are more than just a place to stay, they’ll give you plenty of opportunities to meet like-minded travellers, and #MeetTheWorld in the best way possible! Located in the buzzing cobbled streets of the oldest part of Istanbul, Cheers Lighthouse Hostel, is the perfect place to meet new people. The amazing hostel staff organise social events every day, such as pub crawls on Fridays, Turkish Night on Saturdays (featuring amazing belly dancers), walking tours, happy hours and so much more! It’s basically impossible to get bored here. Every room has been freshly renovated and you’ll get a typical Turkish buffet breakfast every day, for free! Don’t forget to jump in the sauna (or the Jacuzzi) after a long day spent wandering around. Dreams DO come true after all! The name of this hostel speaks for itself! This is definitely one of the best hostels in Istanbul if you are travelling solo and you want a real taste of Turkey. Located between the old and the new town, it’s the perfect base to explore the city, with all the hotspots in walking distance. Second Home Hostel organises weekly Turkish dinners and pub crawls in Taksim – which is the heart of Istanbul’s nightlife. You’ll be able to smoke some hookah on the rooftop terrace with fellow backpackers while exchanging life stories. This is not only one of the best hostels in Istanbul, but probably one of the most beautiful too! With its laid-back and fun atmosphere, it’s the perfect spot to meet other backpackers and it’s also a great place to start your Istanbul adventure. Bunk Hostel is very close to Taksim Square and Istiklal Street, where you’ll find plenty of bars and restaurants. There’s a free Turkish breakfast served every day, a rooftop terrace overlooking Istanbul, and not to mention this hostel’s perfectly designed interiors. Award-winning Cheers Hostel is the real deal! Situated in the heart of the Old City in Sultanahmet, it’s walking distance from the iconic Hagia Sophia’s Cathedral, the Grand Bazaar, the Blue Mosque and many other hot spots. Cheers Hostels has a unique and quirky design that will fire up your Insta feed! Get ready to make everyone jealous with your pics from the hostel’s Winter-garden Panoramic Terrace Bar, with a breathtaking view over the city. If you decide to visit Istanbul during the summer, you’ll be able to enjoy their free Turkish breakfast on the terrace while sunbathing and having a chat with fellow backpackers. Cheers Hostel is definitely one of the best hostels in Istanbul! Are you one of those couple that likes to socialise but still have your own privacy? Well, we’ve got you sorted! Cheers Vintage Hostel is one of the best hostels in Istanbul with the most amazing private rooms! Located in Sultanahmet, 5 minutes’ walk to Hagia Sophia and the Blue Mosque, it’s a beautiful place to stay, with incredible views from the private rooms and the terrace. We’re SOLD! Bucoleon is another spectacular hostel from the Cheers Hostel family! You can find Bucoleon in the historical quarter of Sultanahmet, 5 minutes’ walk from Hagia Sophia. This is one of the best hostels for couples in Istanbul, I mean just look at that room! Walking tours and pub crawls are organised weekly and you’ll have free breakfast every day. If you came to Istanbul to socialise and make new friends, this is the spot! Bahaus Guesthouse Hostel has more than 8K reviews and a 9.5 rating, really impressive! One of you said: “Awesome place, amazing balcony view. The hostel has good tours which are well priced and convenient. Staff is really friendly and social and organise nights out with guests. Shout out to Nurlan for great advice on getting around the city and for philosophical conversations at 3am. Also, the location is literally only a 100m from Hagia Sophia, Blue Mosque, many museums, tram station, and the ferry pier!” Bahaus Guesthouse Hostel organises cool parties and BBQs on the rooftop. They really do everything they can to make sure you have the best time ever! Looking for a home away from home? You’ve just found it! Jumba Hostel is a stylish and cosy hostel in the Cukurcuma district, run by three sisters who will provide you with everything you need. They organise events, pub crawls, they cook amazing breakfasts and they take care of this cute hostel like a boss! Jumba Hostel is very close to all the main attractions, so it’s very easy to explore the city too. If you decide to stay in Sultanahmet, this hostel is a very good choice. It’s in the perfect location, only a few minutes from the Blue Mosque, Hagia Sophia and Topkapi Palace. Istiklal Hostel has a beautiful outdoor terrace overlooking the city where you can hang out and have a chat with other travellers. Literally a few steps away from Taksim Square, this hostel is in a restored 19th-century building with a great rooftop terrace where you can chill with a book and a Turkish tea. The area around the hostel is filled with bars and restaurants, so make sure to ask the staff for tips, as they are some of the nicest people ever! Hush Hostel Moda is a fun, clean and cheap place to stay in Istanbul. This hostel is located in the trendy district of Kad?köy, where you’ll find loads of bars and pubs, live music and restaurants. This hostel is in a historical bazaar and it has an awesome rooftop terrace, where you can enjoy the view and some tea, while you chat with fellow backpackers. A delicious (and free) breakfast is served every morning, so make sure to start your day right! Hush Hostel Lounge (sister hostel of the one above), has great backpacker vibes, you’ll also have a graffiti gallery: The Hush Art Gallery! This area of Istanbul is very lively and has great nightlife too, so make sure to gather some of your new hostel friends and go experience the Turkish way of fun! Hush Hostel Lounge also has great common areas, both outdoor and indoors. Definitely one of the best hostels in Istanbul! We hope this guide helps you to discover the perfect hostels for your trip to Istanbul. Let us know in the comments if you’ve stayed in one of our recommended hostels, or if you’d like to share a hostel that you think other backpackers shouldn’t miss. Now that you know about the best hostels in Istanbul, it’s time to plan the rest of your trip!